How do you capture 250,000 stories? One story at a time. at the Roosevelt Hotel, the site of the first Academy Awards. It gave me the chance to highlight last year's achievements, and to challenge Hollywood's movers and shakers to keep Tinseltown's renaissance going strong. introduce each of these extraordinary individuals to you in the following few blog posts, but for the moment let me again extend my thanks to each of them for allowing me to share their stories. we've learned here about solving the housing crisis, easing transportation, and making Los Angeles the second-safest big city in America, and to apply them to all of Los Angeles. Hollywood has seen a lot of progress in the last few years, but the real test will be our ability to make it a lasting progress, and to use the momentum we've gathered to bring about even more positive change in Hollywood and all of L.A. I'll expand on this as I tell you about my six guests. Thursday was the one year anniversary of the Metrolink crash. I remember all too clearly walking the site of the crash one year ago. Eleven people died on that day, and nearly two hundred were injured. The memorial Thursday morning was simple and beautiful. With a flag suspended from the outstretched ladders of two fire trucks, the survivors and the families of the deceased presented plaques to honor the first responders who saved lives amid the destruction. Firefighters were preceded to the scene by the employees of the Costco at the crash site, who lept towards the accident with selfless bravery that every one of us would hope to have if called upon. Steve Toby, a technician with Los Angeles' Information Technology Agency who I know well from his work on the Council floor and from press conferences, was away from work for months after the crash. Thursday was his first return to the site of it, as it was for many there. Steve's story was told in the Los Angeles Times article about the bitter anniversary, as were other horrible, heartbreaking stories. 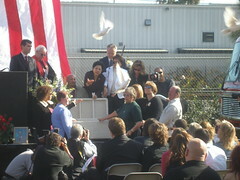 At the end, eleven white doves were released to honor the eleven who did not survive the crash. Among the deceased was Julia Bennett, an employee of the Los Angeles Fire Department, remembered here. Trauma experts say that the second year, when support begins to wane and memory begins to recede for all but those directly affected, can be the hardest. I asked those in attendance to commit to not letting that happen: to making this day not about letting go of the past but committing to stay with those whom it will not let go. For those of you who like your CD13 blog news up-to-the-minute, I've added a feed to my blog. That means that you can read your blog entries as they're published in news aggregator software like Net News Wire or Sage or any of these. For those of you who like your CD13 blog news up-to-the-minute but have no idea what that all means, here's an introduction to news readers and feeds. Simple version: you can use one program to read all of your blogs so that you don't have to keep checking back to see if you missed a new post. What's Your Favorite L.A. Building? Frances Anderton, host of the KCRW show DnA: Design and Architecture, asked me that very question. (RealPlayer link here.) For me, the answer was obvious: City Hall. 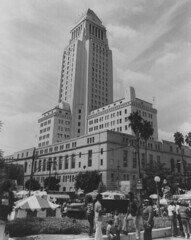 Designed by the firm of Austin, Parkinson, and Martin and finished in 1928, the building was damaged in the Long Beach earthquake and re-opened just months after I took office in 2001. It contains sand from each of California's 58 counties and water from its 21 missions. There are some great detail photos at Project Restore's homepage, but none of them capture what it's like to come to work here and be able to look up at the magnificent design, knowing that this is the public's building. To those readers who've never seen it, you should take the red line downtown on a Tuesday, Wednesday or Friday and see Council Chambers when it's a living temple of democracy. Then take the elevators up to the 28th floor, and walk up the stairs into the Tom Bradley Room, from whose balconies you can see a whole lot of Los Angeles. What's your favorite building in Los Angeles? Send us your favorites and we will post some of the best answers here. The Service Employees International Union has sponsorsed a "Since Sliced Bread" contest. The contest, open to all, seeks "the best idea since sliced bread" about how we could "create the kinds of jobs that allow people to raise families, obtain affordable health insurance, pay for college and save for retirement." 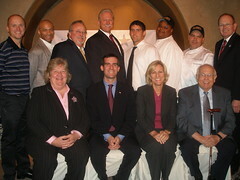 The contest has already received more than 22,000 entries, and a panel of judges has whittled them down to 7 finalists. Go vote for the top 3 ideas, and then send me your ideas: what would be the best idea since sliced bread for Los Angeles? In this guest blog entry, Councilmember Wendy Greuel from the great 2nd district previews Hollywood’s latest innovation, the Holly Trolley. On Monday night, I got to ride with Eric Garcetti and Honorary Hollywood Mayor Johnny Grant on the maiden voyage of the Holly Trolley. The trolley is a fun, safe way for club-goers to move around and hop from restaurants, bars and clubs throughout Hollywood. And it’s symbolic of the exciting Hollywood resurgence of the past few years thanks to a truly unique and critical public private partnership. 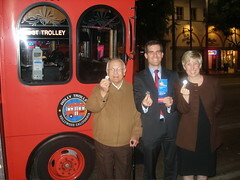 As Chair of the City Council’s Transportation Committee, I love how the Holly Trolley connects public transportation to entertainment and nightlife. Its stops along Hollywood's Red Line stations allow diners and club-goers who live in my Valley district, for example, or anywhere along the Red Line, to see Hollywood but leave their cars at home. The Trolley will get cars off the road and give some club-goers a safe alternative to drinking and driving. I want to see the Holly Trolley succeed, not only to continue to infuse Hollywood's entertainment district with patrons and provide alternatives to a frustrating lack of parking and exorbitant valet fees, but also to see where we can replicate this service around the city. Congratulations to Council President Garcetti and his staff for their commitment to this project and to the club owners and everyone who worked so hard to create a truly unique service. It‘s going to help ease traffic snarls, it’s going to show us how to use public transportation in a way that interacts with our city’s most vibrant business districts, and—not least—it’s going to be fun. The Holly Trolley is in service Thursday, Friday and Saturday nights from 8:00 pm to 4:00 am. Tickets are $1, last the whole night, and may be purchased on board the Trolley with cash or with promotional tokens distributed by many Hollywood nightclubs. For route information, please see www.HollywoodTrolleys.com. Got cable? Tune in to Channel 35 tonight, January 9th, at 8 p.m. to see the second installment of my food show, Flavors of L.A. Los Angeles' cultural diversity doesn't just mean we have more than 100 languages spoken here, it also means we have about as many ways to fry an egg or serve up a rack of lamb. In this episode, we tour Jan Perry's great Downtown-to-South LA district and taste great tea, authentic Oaxacan cuisine, and some amazing Hawaiian desserts. The show will run again on January 20th and 10:00 pm; on January 23 at 11:00 am and 8:00 pm; and on February 3 at 10:00 pm. Check it out! For more information, here's the Channel 35 program guide (pdf link). I want to thank Bishop Jon Bruno at the Episcopal Diocese and Jim Santangelo and Albert Valdivia from Teamsters Joint Council 42. Last December, the Diocese found itself with enough hurricane relief supplies (tools, paper goods, food, etc.) to fill an 18-wheeler. And the Teamsters had...an 18-wheeler. CD13 did a little matchmaking, and volunteers from the Teamsters drove the truck full of sweet relief to Mississippi. Thanks to all! ...is Los Angeles. That was the overwhelming lesson of the Compstat session I attended today with Mayor Villaraigosa, Councilmember Jack Weiss, and, of course, Chief Bratton. The 14% drop in crime we announced today means six hundred robberies weren't committed. It means one hundred fewer rapes. It means thirty individuals were at home over the holidays, not lost to homicides. It means that thousands more men, women and children lived freer lives in Los Angeles, breathing hope and not burdened by fear. And it means that the LAPD is doing an outstanding job. They are communicating their work better than ever as well. You can see for yourself how they are doing, neighborhood by neighborhood, at their statistics page. Download your part of the city from the pull-down window. Soon they will be complementing that information with block-by-block crime maps, giving neighbors a very complete sense of where crime is--and where it isn't anymore. If it's not working, how do we or should we fix it? What new strategies should be implemented? And step by step, they address the fear and violence that we battle in our neighborhoods. looking at the model used in Chicago, where any homicide is treated as a public health emergency. Ernani Bernardi, the former councilmember from the Northeast Valley (and who swore in my colleague Alex Padilla, who holds his seat today), has died at the age of 94. Any one who has lived in Los Angeles, has voted in Los Angeles, or has aspired to serve the people of Los Angeles must shed a tear at the dimming of this light. Councilmember Bernardi was well and rightly known as "the conscience of the council" through his work on political transparency, campaign finance, rent control, and much more. May his spirit guide our reflection and our stewardship of the city he loved. After years of false starts and shelves full of dusty reports, the city has made good on its commitment to real business tax reform. My colleague Wendy Greuel has been the uncontested leader on this issue, pushing past the limits that had previously stalled out other would-be reformers. Together, we introduced the Greuel-Garcetti tax reform package, which helps individual creative artists, small businesses, small- and medium-sized production companies, and lowers the tax rate overall. Starting this year, the city will cut business taxes across the board, towards a five-year goal of a 15% reduction. The reform is funded by AB63 monies, meaning that new revenues from folks who don't pay their business tax makes this possible without hurting the city budget. Here are the highlights from the reforms that go into effect this year. Remember, even those who are exempt still need to file with the city Office of Finance to demonstrate exemption. 2006: all businesses with gross receipts of $50,000 or less will be exempt from the business tax. 2007: businesses with gross receipts of $100,000 or less will be exempt from the gross receipts. Altogether, this means that 60% of the city’s businesses will pay no business tax. will receive an across the board tax cut of 3.1%. will continue to receive annual cuts of up to 4%. Over five years, rates will be reduced by 15%--and we'll keep looking at how to lower rates further. Writers, directors, actors with gross receipts of $300,000 or less are now exempt from the business tax. Production companies are taxed based on cost rather than on gross receipts. In the past, companies with gross receipts of $50,000 or less paid a flat fee. Companies with costs betweenn $50,000 and $4.2 million also paid a flat fee, increasing incrementally, capped at $12,711 for companies with costs that are $4.2 million or higher. New system: companies with gross receipts of $2.5 million or less will pay a flat fee of $147. Companies with gross receipts between $2.5 million and $12 million will be taxed $1.30 per $1,000 and companies with $12 million or above will pay a flat fee of $12,711. Happy new year! I kicked off the new year by meeting up with a few friends at Grauman's Chinese Theater to announce that our tourism economy is stronger than ever. 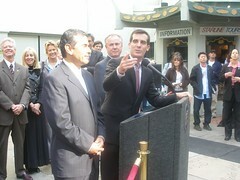 24.9 million tourists visited Los Angeles in 2005, putting $12.7 billion in our local economy. 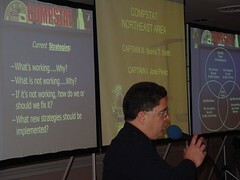 We booked record convention business in December that will continue to pay off for years to come. Our hotel occupancy rate reached the fourth-highest number in the country, our cruise traffic grew, and we can look forward to steady growth in this sector. Just like the world-class attractions around the corner that you forget to visit until a visitor comes and wants to do the "touristy" things, few of us think about how vital the tourism industry is to our local economy. But tourist spending creates jobs--often good, unionized jobs--and tax revenues that fund city services. So let's keep the welcome mat out for visitors from near and far in 2006. Don't let your Christmas tree take up space in our landfills--recycle it at a city recycling center.